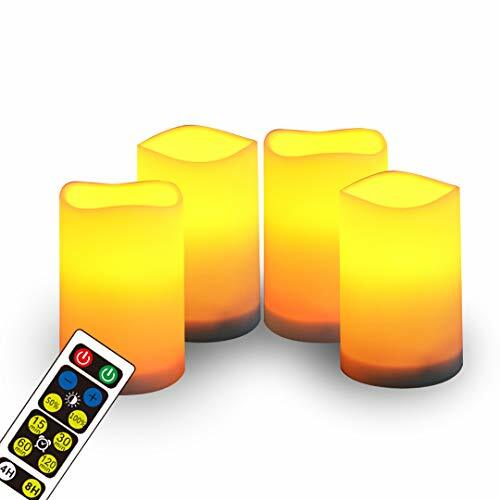 Remote Control & Timer Set:Weatherproof resin remote control color changing candles,Adjustable Brightness Control, Timer seter, once the timer is set, the candle comes on at the same time each day and stays on for either 4 hours/8 hours or by mins. ·Realistic and convenient LED lights for every room in your home. 【FOR OUTDOOR & INDOOR USE】 Ideal for outdoors with no wax to melt,For indoor and outdoor use. Can be used in hot weather/under the sun, and designed to withstand light rain but not heavy rain. 【Remote Control & Timer Set】 Weatherproof resin remote control color changing candles,Adjustable Brightness Control, Timer seter, once the timer is set, the candle comes on at the same time each day and stays on for either 4 hours/8 hours or by mins. 【Flameless Candles】 Light is created by LED, No risk of fire, no fume and no wax mess. Safe to use around children and pets, LED candles without real fire, never worry about fire-related accidents. 【SUPER LONG BATTERY LIFE】 3 AAA batteries(Not included) (high-grade battery required) lasts a long time. Longer battery life means that fewer batteries will be used, therefore you spend less on batteries. In addition fewer battery consumption is better for environment. 【Products Include】 2.5"(Diameter) X 4"(Height);Candles*4 + Remote Control*1 + Manual*1 , Requires 3 x AAA batteries per candle. If you have any questions about this product by WRalwaysLX, contact us by completing and submitting the form below. If you are looking for a specif part number, please include it with your message.